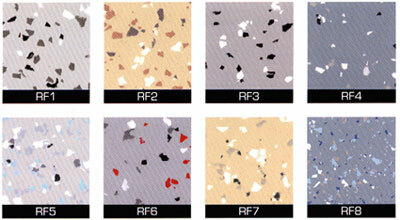 A decorative floor system which incorporates acrylic colored chips or flakes randomly broadcast over a solid color background. 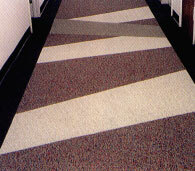 The DecoFlake "Random Broadcast" is an excellent alternative to vinyl tile-without the seams or joints. This decorative floor system has good chemical resistance, is available in a variety of slip resistant textures, and provides excellent, abrasion resistance. 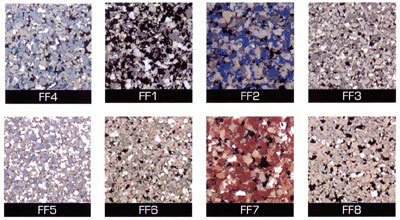 The DecoFlake "Full Broadcast" system (similar to the "Random" system) is a unique floor surface which combines colored acrylic chips or flakes - totally dispersed across the surface of the floor, giving it a "Terrazzo Like" appearance. This system requires minimum maintenance, plus provides an extremely durable floor surface even for the highest traffic areas. In addition, the DecoFlake "Full Broadcast" floor system can be installed in an almost unlimited combination of colors and variety of slip resistant textures to match virtually any environment or motif.